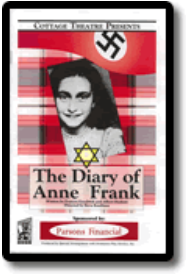 The Diary of Anne Frank is presented through special arrangement with Dramatists Play Service, Inc. Adapted from Anne Frank: The Diary of a Young Girl, edited by Otto Frank. Winner of the 1956 Pulitzer Prize, Tony Award, Critics Circle Award, and virtually every other coveted prize of the theatre. Very few plays have moved the Broadway critics to write such glowing notices, receiving the unanimous acclaim of all the top New York reviewers. The NY Times, said, "A lovely tender drama . . . Strange how the shining spirit of a young girl now dead can filter down through the years and inspire a group of theatrical professionals in a foreign land." The NY Herald-Tribune said, "The precise quality of the new play at the Cort is the quality of glowing, ineradicable life — life in its warmth, its wonder, its spasms of anguish and its wild and flaring humor . . . Frances Goodrich and Albert Hackett have fashioned a wonderfully sensitive and theatrically craftsmanlike narrative out of the real-life legacy left us by a spirited and straightforward Jewish girl . . . as bright and shining as a banner." The NY Post called it "…a moving document on the stage." The NY Daily News said, "There is so much beauty, warm humor, gentle pity…in The Diary of Anne Frank that it is difficult to imagine how this play could be contained in one set on one stage . . . this is a fine drama."